Flash And Roll, under champion jockey G.R. Carter, Jr., defeats Jess Macho Corona (#1) in the $972,750 Golden State Million Futurity(G1) Sunday night at Los Alamitos Race Course. LOS ALAMITOS, CA—NOVEMBER 4, 2018— Since arriving from Ruidoso Downs in late summer, Scott Bryant's Flash And Roll has made things look easy in her first two autumn starts at Los Alamitos. First, the filly sired by the 2009 champion stallion First Moonflash and out of '09 champion aged mare Stylish Jess Br dominated her 400-yard trial to the Grade 1, $976,750 Golden State Million Futurity by posting a two length victory in her California debut. The Julianna Hawn Holt-bred filly then returned in the final with another impressive performance, leading every step of the way in route to a ½ length victory over Turner Farms' Jess Macho Corona on Sunday at Los Alamitos. With 10-time AQHA champion jockey G.R. Carter in the irons for trainer Justin Joiner, Flash And Roll broke on top from post number four and was in control from that point on. Jess Macho Corona and third place finisher Apollitical Pence both made runs at her, but there was no catching the California-bred filly. "When she runs a good race, that's how she breaks," Joiner said. "She's still pretty quick footed for the first 50 yards out of the gate. If she can get out in front of those horses like that, she's tough to outrun. I noticed about the gap, halfway down through here, she looked like she started looking at something. Luckily having a good rider like G.R., who didn't panicked, got her back on stride. She finished the race really nice. I was a little concerned there for a second, but when you have a good driver the vehicle usually goes forward." Carter, who has piloted over 3,800 winners, announced earlier this year that he's planning to retire at the end of 2018. If that's the case then Flash And Roll is doing her part to help Carter complete a great final chapter to his Los Alamitos career. "We have to build up (Carter's) retirement fund any way we can," Joiner said jokingly after the race. "You can't have a better rider. G.R. is a professional. He's tough to beat. He really is. He's cool under pressure. He's done this a long time and he's fun to work with." This was Carter's third victory in the Golden State. He won the 2002 running with the filly First Place Queen and the 2003 renewal with Be A Bono. With Carter in the saddle, Flash And Roll has now won four of her five career starts. 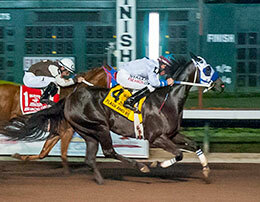 She covered the 400 yards in the Golden State Million in :19.665 and earned $395,955 in her second futurity appearance. She qualified to the Ruidoso Futurity earlier this year – finishing seventh after a poor start – and also posted a victory in her trial to the All American Futurity, although she did not qualify to that final. Shortly after that trial race, her connections shipped to Los Alamitos. "She hauled out here a little rough so we gave her a little time off before we came back training on her," Joiner said. "We got her ready for the trials and she ran an awesome trial. She wasn't tired after the trials. I gave her four or five days off. I brought her to the track to evaluate her and she went like a million dollars She came back great for the final. We didn't have to do much to her. She got me a little worried. She just got a little hot coming up here and in the paddock…. Most really good horses that really like to run, the lights, new conditions, new track, don't tend to bother them near as much. It didn't seem to bother her either. I was relieved after the trials that she was professional about it and ran her trial the way she did and finished the way she did and qualified." For Joiner, this was his first ever stakes win at Los Alamitos to become the third member of his family with a stakes win at Los Alamitos. 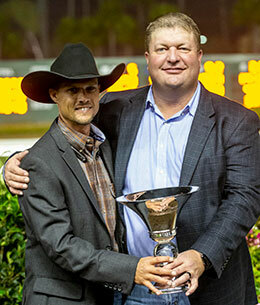 His father, longtime Quarter Horse trainer Mike Joiner, can list the 2006 Ed Burke Million Futurity with champion FDD Dynasty among his many stakes wins here, while his brother, Cody Joiner, won 141 races and 13 stakes victories during his tenure at the Orange County track. Ten-time AQHA Racing Champion jockey G.R. 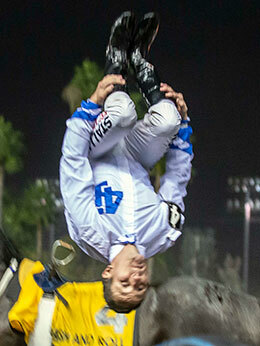 Carter, Jr. does his famous "backflip" off Grade 1 winner Flash And Roll Sunday night in the Los Alamitos winner's circle. "It's hard to win these races," Justin Joiner said. "Twelve years later after the Ed Burke Million, we're doing it again. We have a family business. Everybody does their part anywhere they go and everybody deserves that amount of credit. My dad is in Hobbs and Zia Park. I do a lot of the traveling. When we used to go to Oklahoma City, I would go to Oklahoma City. I went there for six years. I had Valiant Hero and Louisiana Senator. My dad would concentrate on the Ruidoso horses. When I finish here, I'll go back to Sunland Park to get the 2-year-olds ready to run at Ruidoso (in 2019). We'll be here up to around Christmas. I do have Bodacious Eagle, who ran second in the Robert Boniface Los Alamitos Invitational. We're going to run him in the Z. Wayne Griffin Directors Trials. With a little luck we'll qualify him to the Champion of Champions. I brought 11 horses here. All 2-year-olds and one six-year-old (Bodacious Eagle)." Joiner was also thrilled to share this victory with Scott Bryant of Midland and Lubbock, Texas. "You can't say enough about Scott," the trainer said. "He's about as laid back as they come. If they were more like him, it would probably make this job too easy. Bryant, who works in the oil and gas industry, met the Joiners thanks to his longtime friend, Joe Dee Brooks. 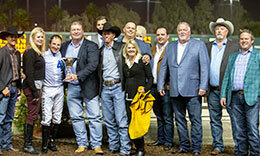 Bryant joined Brooks in the partnership that campaigned the Mike Joiner-trained millionaire First Valiant Sign, the winner of the 2015 Ruidoso Futurity and 2016 Texas Classic Derby. Bryant has been in the sport ever since. "We still do group horses, but my wife and I started doing our own thing," Bryant said. "It seems like every year we add a few more. We have about 35 horses right now. Some are at Zia Park. We also have a couple of broodmares and we bought a couple of embryos at the sale in New Mexico back in August. Bryant paid $200,000 for Flash And Roll in the 2017 Ruidoso Select Yearling Sale. "I appreciate the Joiners too," he added. "They're the most wonderful people for sure. We bought (Flash And Roll) at the Ruidoso Select Sale. The Joiners liked the filly." Watching the race from the Vessels Club at Los Alamitos with a group that included his good friend, Joe Dee Brooks, Bryant rooted with joy when he spotted his filly as she appeared from the fog shortly after the start. "It was a little foggy down at the end (by the gate)," he said. "It was kind of hard to see from where we were sitting. As soon as we could see, we were really excited." Now with $440,255, Flash And Roll will make her next start in the trials to the Los Alamitos Two Million Futurity on Sunday, November 25. "We're looking forward to it," Bryant added. Ridden by Cody Jensen for trainer Paul Jones, Jess Macho Corona earned $160,267 for his runner-up effort in the Golden State Million. The homebred gelding by Corona Cartel and out of Jess Send Me ran third in the Ed Burke Million earlier this year. He's now earned $297,302 from his seven starts. Matthew Dunn's Apollitical Pence earned $113,130 for finishing third. The Apollitical Jess gelding was saddled by Monty Arrossa and ridden by Saul Ramirez, Jr. Apollitical Pence ran in the Ed Burke Million earlier this year. Dunn and Arrossa joined forces earlier on Sunday night to win the $30,000 Golden State Juvenile (see related story) with the lightly raced Foose filly Seaduction. 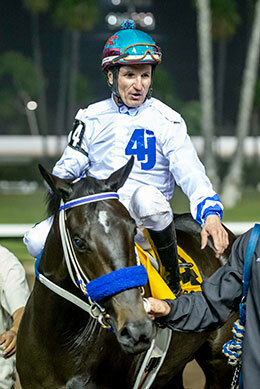 Richard Frandsen's Favorite Motion, the fastest qualifier and 9-5 favorite, earned $65,992 for running fourth. Cruz Mendez piloted the Favorite Cartel gelding for trainer Jose Flores. Ali Babe Foose, Wicked Affair, Symbol Of Faith, You Caught My Eye, Powerful Favorite and Tequila Sangria completed the field.